An isolation transformer is a transformer used to transfer electrical power from a source of alternating current power to some equipment or device while isolating the powered device from the power source, usually for safety reasons. Isolation transformers provide galvanic isolation and are used to protect against electric shock, to suppress electrical noise in sensitive devices, or to transfer power between two circuits which must not be connected. A transformer sold for isolation is often built with special insulation between primary and secondary, and is specified to withstand a high voltage between windings. Once inside your house, the PEN conductor is separated into the neutral and live conductors (via a fuse) inside your consumer unit / distribution board aka fuse board. Note that here, the neutral and earth are bonded together which means that the voltage from live to neutral is the same as live to earth – a nominal 230V, and the voltage from neutral to earth is zero (as they are bonded together). Also note that the live conductor is split into feeds for your different circuits each protected with a circuit breaker or fuse. For extra protection a residual current device (RCD) may also be fitted. Whereas a fuse or circuit breaker will generally require many amps of current to trip or blow an RCD trips with around 30mA of current flow to earth (actually an imbalance between the live and neutral currents which in normal operation are the same). It is used to provide extra protection when contact with water may be experienced, or other potentially hazardous situations. Remember this! The idea behind this arrangement is for electrical safety. Should a live conductor become detached from inside a piece of equipment and touch the earthed chassis then a high current will flow and blow the fuse or trip the breaker. The same result will be obtained if the equipment should develop a short circuit between live and neutral. If an electric shower has an exposed conductor that water comes in contact with, then there will be a smaller electrical current that will flow from live to earth and this is detected by the RCD which will trip and remove electrical power to the faulty piece of equipment (and everything else on the same circuit). Handy if you’re naked in an earthed bath. So now we have three conductors at our wall outlet. 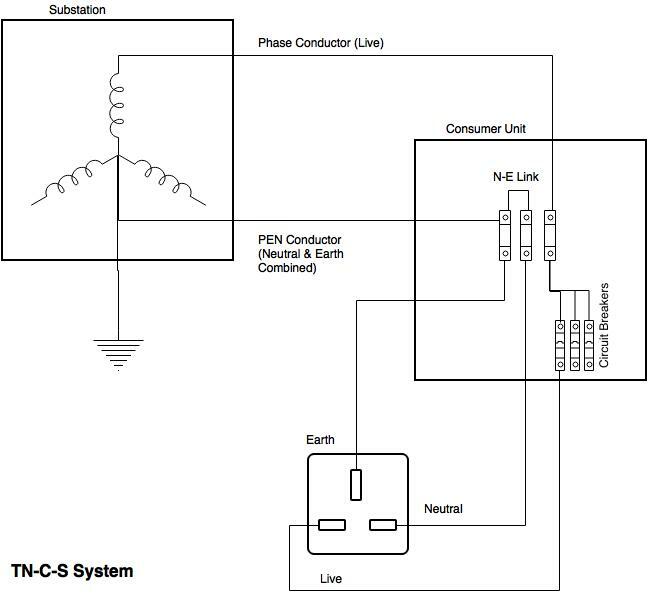 Assuming we are connected to earth (as we are standing on it), then we will receive an electric shock if we happen to come into contact with the live conductor, but we will be safe if we touch the neutral conductor (as Neutral to earth voltage is zero). If we’re isolated from earth (eg with rubber boots) then we could touch the live conductor and not receive a shock. If we touch both the live and neutral conductors then we will get a shock of course. So how can the isolation transformer be used for electrical safety? It all comes down to what a transformer actually is. In the simplest terms it is two coils of wire around an iron core. The incoming coil – called the primary – converts an electric field into a magnetic one. This magnetic field then induces an electric field on the second coil and hence a voltage appears on the output of this coil (called the secondary). By varying the number of turns in the coils the voltage can be stepped up or down, but in our case the number of turns are equal and so the output voltage is the same as the input voltage. However, the point to grasp here is that there is no electrical connection between the input and the output. The link is done by magnetism. This means that the output is “isolated” from the input and hence the term isolation transformer! The output of the isolation transformer still has a nominal output voltage of 230V between its output conductors, but there is no link to earth. This means that you can safely touch either conductor without risk of electric shock. You will still get an electric shock if you touch both conductors however! It is important to note that with an isolation transformer, a device that may have an earth fault that would trip a circuit breaker or blow a fuse will work just fine. In fact, isolation transformers are used for this very reason in certain applications where the sudden disconnection of power due to an earth fault may cause even larger hazards (such as in chemical plants, or in operating theaters). In such cases monitoring is usually provided so that an alarm is raised should this occur. In the diagram above, taking an installation without an isolation transformer, the device has an earth fault (for example a live conductor has shorted to the chassis). Since Neutral and Earth are bonded in the consumer unit the system sees this as a short circuit and so a large current will flow which will blow the fuse or trip a circuit breaker. It would also trip an RCD if fitted. When an isolation transformer is put in circuit, nothing will happen. This is because the secondary live and neutral are no longer live and neutral. They really should be called phase 1 and phase 2 hence I’ve put them in quotes. Since they are no longer live and neutral there is no reference to the incoming earth, and therefore no fault current can flow. In this case since there is a fault from “live” to earth, this “live” effectively becomes the equivalent of neutral and the “neutral” effectively becomes live. 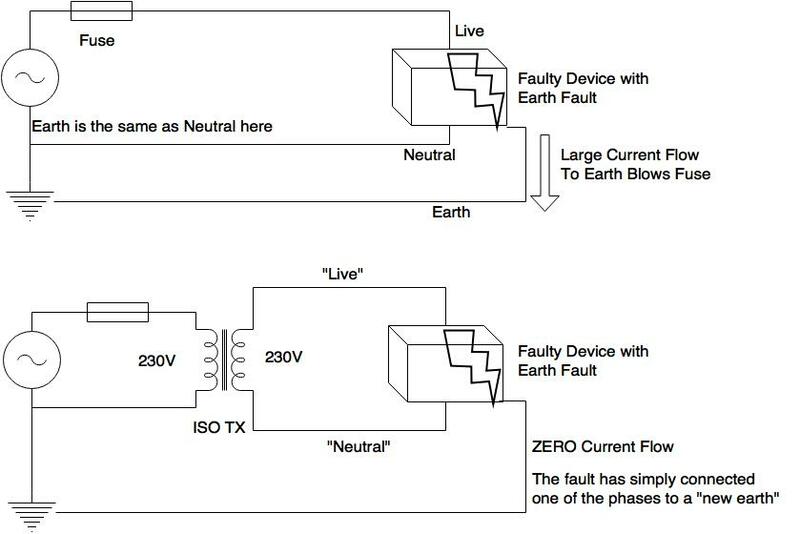 In the diagram above you would have 230V between “live” and “neutral”, 230V between “neutral” and earth and zero volts between “live” and earth. However, the main use of an isolation transformer for safety is when people are working live an accidental touch of a live conductor will not cause an electric shock, or that there is risk of damage to cables etc. such as in building sites. Another consequence of this is that “earth leakage” that is, a trickle of current from live to earth, caused by mains filters, is eliminated. Since there is no direct earth connection, then there is nowhere for the earth leakage to flow to. This can be advantageous in patient vicinity applications or to reduce earth leakage from several devices to avoid nuisance RCD trips. Use of the Isolation Transformer for reducing electrical noise. The transformer, being a coil, has what is known as inductance. Inductance is a barrier to high frequency signals. Electrical noise is a high frequency signal and so the transformer acts as a block to this. Other power problems can also be reduced especially if there is an electrostatic screen in the transformer construction which is connected to earth. Any electrical transients between the power conductors and earth can be effectively reduced using this method. Disturbances between the power conductors can be reduced by the inductance but not eliminated. This is why in dedicated power conditioning devices that incorporate isolation transformers, further filtration is placed on the secondary side of the transformer to reduce this further. Rather than go into details about this, this piece makes for good bedtime reading. Or you can just take my word for it. In complex electrical installations, or some where the wiring may be old, have poor connections or otherwise has excessive impedance, the voltage between neutral and earth can increase, particularly at the furthest points from the distribution board and particularly where high currents are involved. This may, or may not be a problem for your electrical equipment. You could just rebond the neutral to earth again, but electrical codes do not allow for this. However since the secondary is isolated from the primary you can safely derive a new neutral and earth by bonding these together at the secondary of the isolation transformer. This is also done to eliminate noise between “neutral” and earth – as you are shorting it out. There is a safety concern when doing this however. If, for example, equipment in areas that may come into contact with water (for example laboratories) it is desirous to protect this circuit with a residual current device. This is because water is a pretty poor conductor of electricity and in the event a piece of equipment becoming splashed with water not enough current would flow to blow a fuse, but enough current could flow to give somebody who may be in contact with the water and earth a nasty electric shock. Note that is only takes several milliamps of current to cause heart beat disruption. Take the scenario above. To protect operators working on equipment with the risk of water contacting live conductors the circuit has been fitted with an RCD. Should water be spilled onto the equipment and come into contact with live conductors a leakage current will flow causing the RCD to operate. This will disconnect power from the equipment and leave the operator safe. In the next scenario, an isolation transformer has been fitted and supplies the equipment. Should water be spilled now any contact with live conductors will only reference the conductors to earth. No current will flow and hence the operator will be safe and the equipment will continue to operate. In the final scenario, the isolation transformer has had the earth connected to one of the secondary phases creating a new effective neutral-earth bond. Should water now be spilled on the equipment and come into contact with live conductors a current will flow from the phase end of the transformer, to the equipment, through the water to earth and then back to the transformer. Since this current path is contained within the secondary of the transformer, the RCD will not detect an imbalance and will therefore not trip. The operator is now in an unsafe environment with the potential for an electric shock as they may become the lowest point of resistance for the leakage current. It is not only water where such hazards can exist. I recall being told of the case of an unfortunate checkout operator at a major grocery store chain. Unbeknown to her, an electrical cable feeding some equipment had become entangled in her chair mechanism. As she swivelled in the chair this caused a cut in the insulation of the cable which then contacted the live conductor. This circuit was not protected by an RCD but only by circuit breakers. It would therefore take a fault like current to trip the breaker. In this instance the chair made a poor connection to earth and so the chair – and the unfortunate operator – were now at live potential. Everytime she touched something that was earthed – such as the till or conveyer mechanism – she received an electric shock. If the circuit was protected with an RCD then this would not prevent an electric shock but the severity would be reduced and it would only happen once, rather than the multiple times it happened to this poor lady until power could be removed. The retrospective action was indeed to fit RCDs (and do this in all stores). If they were to fit an isolation transformer then the operator would not have received an electric shock at all. No fault would be apparent – save for a visual inspection. If they were to fit an isolation transformer with a N-E bond on the secondary, then this would have negated the effect of the RCD rendering another dangerous situation for the operator. Transformers are not perfect and impedance exists in them that causes a volt drop within the transformer when current flows. The more current that flows the larger the volt drop and so the output voltage falls. The regulation of a transformer is the difference in the no-load voltage to the full load voltage expressed as a percentage. Poor regulation can introduce other problems into a circuit. For example, if the load is non-linear and takes current in high value chunks – such as in rectifiers, then the poor regulation can cause waveform distortion and introduce voltage harmonics into the system. Other problems include the voltage falling too low and causing under-voltage protection systems to operate. Before I go into UPS with isolation transformers it’s probably worth mentioning what happens with transformerless UPS Systems in the event of an earth fault like described above. Earth leakage is not eradicated using a UPS. In fact it is cumulative so the earth leakage of the UPS is added to the earth leakage of the connected loads. This is a consideration for pluggable UPS but that is the subject of another article. 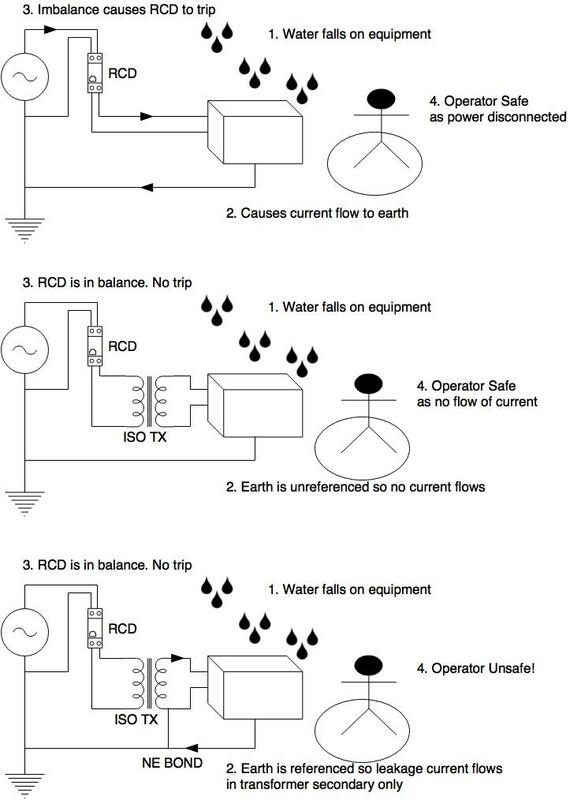 If an earth leakage event occurs that trips the RCD then power to the UPS will be lost and the UPS will do what it is meant to do and that is continue to provide power to the connected load – even if it does have a fault. Note I’m assuming here that this is a fault in the order of tens of milliamps- enough to trip the RCD but not enough to blow a fuse or trip a circuit breaker. This you would feel is a hazard. However, when a UPS is operating from battery it will have (pluggable systems – not always the case on hardwired systems) a back-feed relay. What this does is open to prevent the output of the inverter being present on the incoming supply pins on the UPS. This is effectively the same as isolation. The load is now isolated from the source and therefore no earth leakage current will continue to flow and therefore no hazard will exist. When a UPS has an isolation transformer this provides added power protection but it does require certain considerations. Firstly, it requires a big chunk of copper and iron to be added to it, substantially increasing its weight and physical size. As described above, the creation of a neutral-earth bond on the UPS secondary causes any RCD protection to be redundant, so it is preferable to have the transformer floating. On hardwired UPS systems, if a N-E bond is desired this can be added by the site installers quite easily and any RCD protection installed downstream of the UPS. Also, where in the UPS circuit should the transformer go? Should it be on the input or the output? If it is on the input, then the UPS has the added benefit of the protection afforded by the transformer. It means that the earth leakage of the UPS (and connected equipment) is zero as measured on the input to the UPS. If it is on the output, then the UPS output will always be consistent whether or not it is running from battery power or in normal operation. This would be especially important if a N-E bond is required. In my opinion we consider an input transformer to be the best option, coupled with a truly floating output. This is the safest configuration and one we have incorporated into our TX Series UPS systems. Adding this to the original article to explain in detail why the output voltages to earth are as they are. If we take our isolation transformer on which the output secondaries are not connected to earth. Try as we might there will always be some parasitic capacitance between the output phases to earth, the impedance of which we will call Zp. Then we measure, (using a high impedance voltmeter) between Phase 1 and Phase 2 and we will get the output voltage Vo. Now measuring between Phase 1 and Earth, what will we expect to find? We are measuring the voltage across the parasitic impedance Zp. Assuming this is the same between phase 1 and earth as is between phase 2 and earth, then the voltage measured will be Vm = Vo (Zp / (Zp + Zp) ), or Vm = Vo /2, eg what we measure is half the output voltage. So for a 230V transformer we would expect to measure around 115V. If we connect a piece of equipment to the transformer that contains an input filter, then we will find there are capacitors intentionally connected between the input phases and ground. Ignoring Zp (as Zc<<Zp), then Vm = Vo(Zc/(Zc+Zc)) Eg half Vo again. This is why the measured voltage between phase and ground tends to be around half the transformer output voltage. I can see why at first glance this may cause concern, as it appears that we have a high voltage to earth even via our isolation transformer. However no current will flow (and hence it is safe) if we make a connection between any phase and earth. All we do is now reference that phase to earth. An isolation transformer upstream of the load without a N-E bond will remove any earth leakage and hence any touch current. This will meet medical requirements, eg <0.5mA for IEC601, but note other requirements in this standard may apply. If you have an N-E bond on an isolating transformer (it seems to be the regulation that all such transformers are supplied with this bond in place by default) and then try to test DUT with an oscilloscope this can create a dangerous situation (and destroy the test equipment). So is it best to use isolation transformers with or without N-E bond? The problem with most oscilloscopes is that the GND is just that – earthed, which would cause a short circuit if you happened to connect the GND of the scope to a live conductor in your DUT. So to do this safely you must have no N-E bond. This way your DUT is isolated from the scope GND and therefore the connection of the scope GND to a live conductor will only reference that part to real earth without causing any short. Recently there was short circuit in the transformer feeding power to our school and few homes around. The short circuit was caused by group of squirrels. Due to short circuit a lot of electronic equipment got damaged in school. We have mcb installed but I guess they only trip when short circuit happens in output line which they are guarding. In our case short circuit happened before the mcb as transformer is located outside school premise. So wanted to know what all safety devices are available which can be installed in school to provide safety in this scenario. Also if anyone can suggest safety devices for lightning protection that will be great. 1. No primary ground or no ground coming through from primary to secondary. ISO TX has ground on the output side. 2. Primary ground and ground is coming through to secondary side. ISO TX is NOT grounded. 3. Same as nr 2 but ISO TX is grounded. The situation that I usually consider as most critical in the above situations is there we have a leakage through the patient to ground. A ground that goes through the ISO TX or not should make all the difference here. ISO TX with mid point ground just makes the confusion larger but that is what I have to understand as well. Thanks for your comment. What you seem to be describing is a split-phase or sometimes called balanced system, where you have a 230V (L-N & L-E) system and, using an isolation transformer with 2 secondary windings create a 115-0-115 system, with the zero being the earthed centre tapped point. I’m not sure that this system is guaranteed to half the earth leakage as you now have two phases that can contribute to the earth leakage, thereby making the overall leakage the same. However, to avoid earth leakage travelling from the output transformer to “true earth”, this can be achieved in scheme 1. The problem here I feel, is how do you ensure that the newly created earth will not somehow be referenced to true ground? You would have to take steps to ensure this wouldn’t happen, but if you could then this would satisfy your requirement. In scheme 2, the output is not earthed so you no longer have a 115-0-115 system, but simply a 230V floating system. This should remove the possibility of earth leakage through the patient, but you would need to check the operation of the equipment connected is OK without an earth reference. Scheme 3 would reference the output phases to true ground, thereby allowing leakage from the output transformer to true earth, through the patient. Note, though that this is only the earth leakage generated by the connected equipment, not any current which may be flowing from the source phases to ground, so should be safe. With an isolation transformer floating with respect to earth, when you measure any of the phases to earth you will get phantom readings. You normally find that due to filter networks on any loads connected that the P-E and N-E voltages tend to half way, so 115V for a 230V system. However if nothing is connected then these voltages will just be arbitrary. I’m also facing same problem, can any one explain with detail why Output N-E=110V coming???? I’ve edited the document to explain the output voltage phenomenon on isolation transformers.